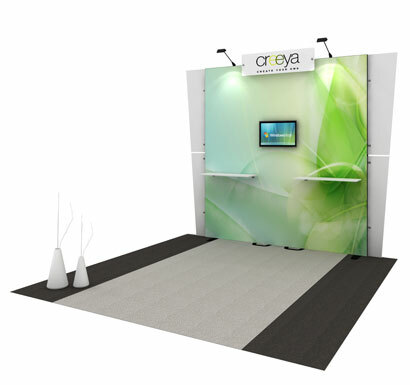 Creeya is light weight tool free portable and modular system which are comprised of 2 basis aluminum profiles. An innovative locking and extension mechanism makes this system ideal for use in small inline exhibits spaces as well as large format displays. It is currently available in 10x10 and 10x20 incline configurations. The uniquely engineered profiles allow use of different graphic media such as fabric, sintra and even wood panels. Accessories: Monitor bracket, product shelf holders in different shapes and sizes, promotional counter, screen mounting attachment and headers to name a few.